Shock absorbers and struts are parts of the vehicle suspension that absorb shocks from the bumps and potholes and keep your vehicle riding smooth and stable. What is the difference between a shock absorber and a strut? 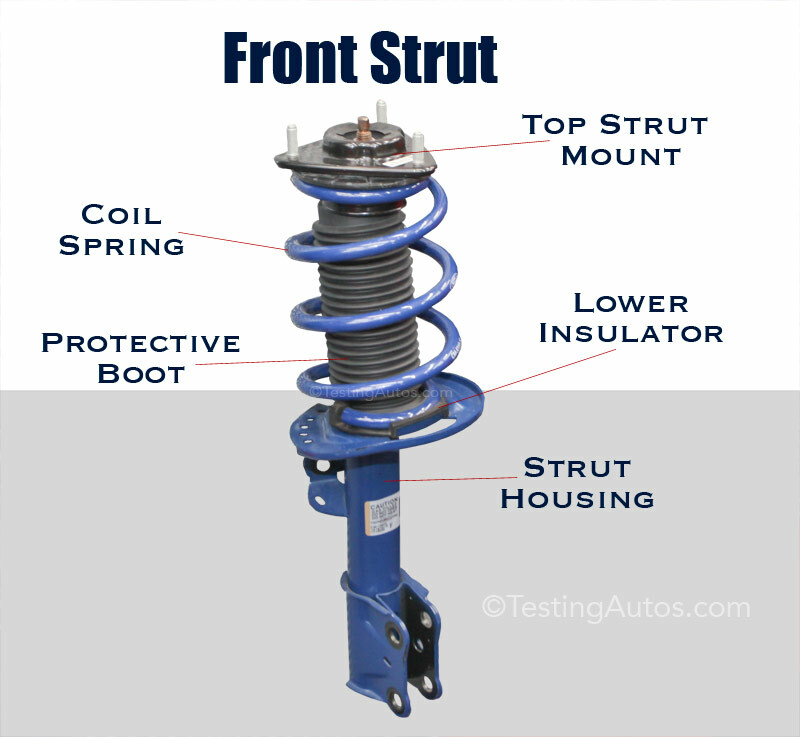 A strut is the shock absorber built into one unit with the coil spring. Front suspension layout with a MacPherson strut. It's also known as a MacPherson strut. 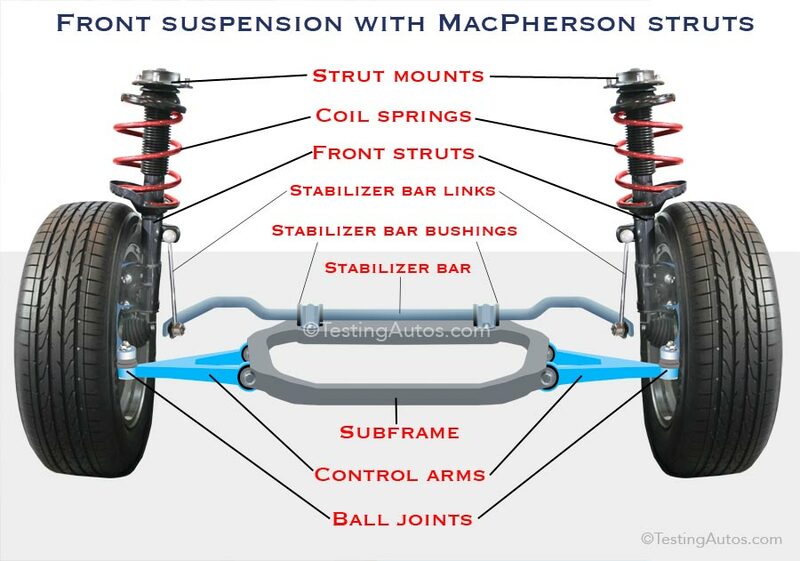 Any car has four struts/shock absorbers; one at each wheel. Most cars and SUVs have struts in the front suspension and shock absorbers or struts in the back. Struts and shock absorbers are maintenance-free units. Does this mean that they never have to be replaced? A strut or a shock absorber doesn't need to be replaced unless there is a problem with it or if you just want to upgrade your ride with new shock absorbers. The most common problem with shocks and struts is when they start leaking. 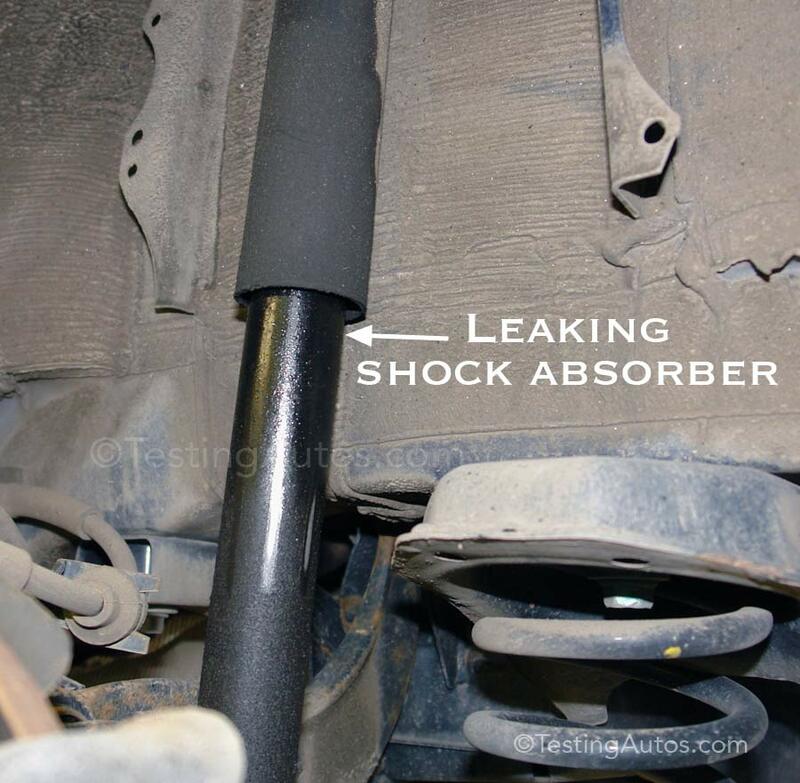 See this photo: leaking rear shock absorber. Struts and shock absorbers are filled with oil. If during a regular inspection, your mechanic noticed that a strut or shock absorber is leaking, it must be replaced, as it will stop working without a sufficient level of oil. Sometimes a shock absorber may stop functioning even without visible leaks. Another problem is that a worn-out strut or shock absorber may produce a knocking noise when driving over bumps. It's not always easy to find the source of the noise in the suspension. Other chassis components must be inspected too, as many parts of the suspension can produce a knocking noise. Many auto repair shops have a portable diagnostic equipment called a Chassis Ear to assist in this type of diagnostics. 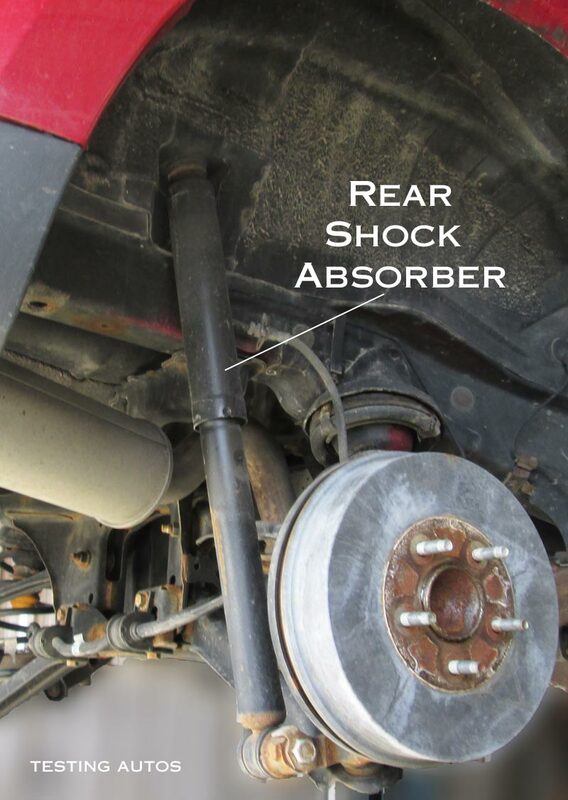 What are the symptoms of a bad shock absorber or strut? Symptoms include bounciness and/or knocking when driving over bumps. You may also notice that your car swings up and down more, like a boat. To pinpoint a weak or failed strut or shock absorber, your mechanic may do a quick "bounce test" where each corner of the vehicle is pushed down and quickly released. The corner with the weak shock absorber or strut will keep bouncing up and down longer, while the corner with the good unit will rebound slowly and will not bounce more than twice. Another common reason to replace struts is after hitting a major pothole, curb or after an accident. In any of these cases, the strut might be bent, which may not be visible, but can be detected during the wheel alignment. Driving with a failed strut or shock absorber is not safe. In addition, if one shock or strut is not working, there is more load on the other three, which will cause them to fail sooner. Do you have to replace both shock absorbers or struts if only one is bad? It's not necessary, but it's usually recommended to replace them in pairs, for example, both front struts or both rear shocks. This is because a new shock absorber will absorb road bumps better than the old one. If you replace only one shock absorber, it may create "unevenness" from side to side when driving over bumps. However, if your car is not very old, replacing only one strut or shock absorber may be enough, since the opposite side is not worn out yet. Do coil springs need to be changed when replacing the struts? The answer is no: if the spring is in a good shape, it can be re-used with the new strut. Read more: When do coil springs need replacing in a car? Do sway bar links (stabilizer bar links) need to be replaced with the struts? 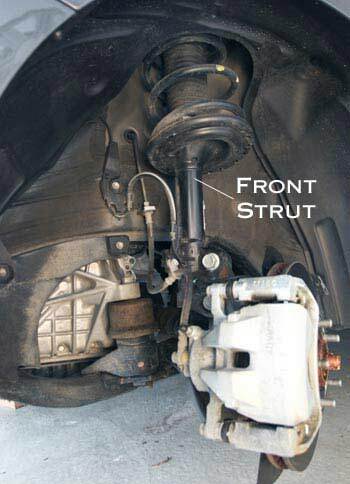 No, but In some cars, sway bar links are connected to the struts, see the image above. A sway bar link must be removed in order to replace a strut. Often, the nut that holds the link seizes up, making it hard to remove without damaging the link. In this case, a sway bar link will also need to be replaced. Sway bar links are not very expensive. Read more: When to replace sway bar links? The cost to replace struts can run from $600 to $850 per pair. When struts are replaced, in most cases the wheel alignment must also be performed. The wheel alignment costs from $80 to $150. 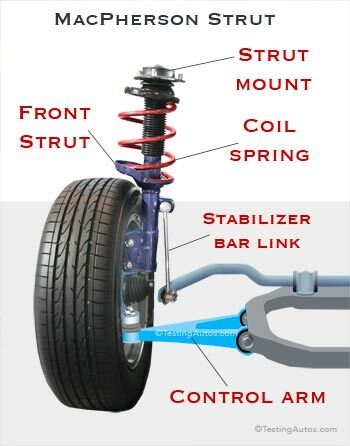 Replacing struts involves removing the coil springs that are under high tension. For this reason, it's not something that can be easily done at home as a DIY project. It's best to trust this job to your mechanic as most repair shops have a special spring compressor tool that can safely assemble or disassemble a loaded strut. Replacing shock absorbers is cheaper: $280-$420 for both. In most cars, you don't need to do the wheel alignment when the shock absorber is replaced.